Tauranga is the largest city in the sunny Bay of Plenty region. Situated on the east coast of the North Island, Tauranga is a great base to explore the region and enjoy its beaches and relaxed lifestyle. 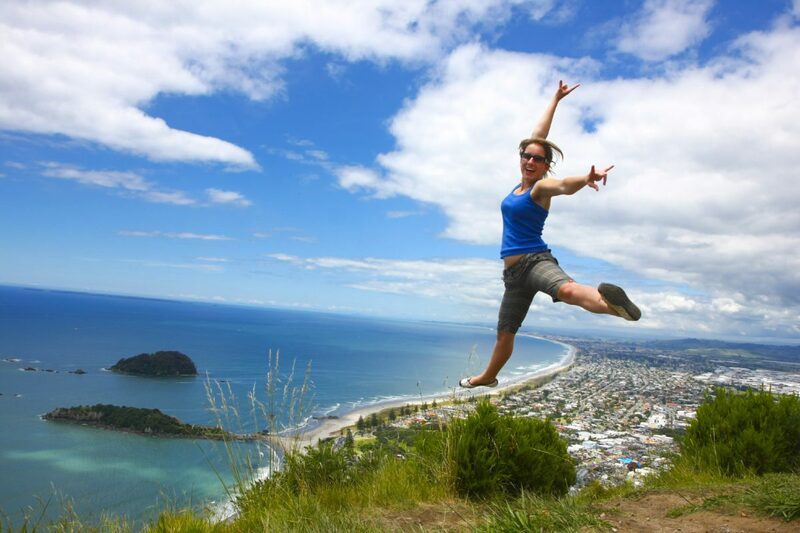 Tauranga is a good place for backpackers to look for seasonal work in New Zealand due to the many farms and orchards nearby. Tauranga sits by the sea and its waterfront area is a lovely place to explore. You can also visit the beach suburb of Mount Maunganui for great surf. ‘The Mount’, as locals call it, is a popular holiday destination for Kiwis, especially on New Year’s Eve. The official name of the mountain at the northern end of the beach is Mauao. Climbing the Mount is a must – it’s a short and steep hike, but the views are worth it! There’s also a walking track around the base of Mauao if you’re not a fan of hills. After a long day’s surfing, the saltwater Mount Hot Pools at the base of the mountain are the perfect place to soak and relax. Southeast of Mount Maunganui, the white sand beaches extend along the coast further than the eye can see. If you love beach holidays, visiting Tauranga and the Bay of Plenty is a must! Make your way from Mount Maunganui to neighbouring Papamoa, to the tiny town of Maketu (home of some seriously good meat pies), all the way to sunny Whakatane. If you’re interested in geology or simply like adventure, take a trip from Tauranga to White Island. White Island is an active volcano off the shore of the east coast. You can visit it by boat, plane or helicopter on a thrilling guided tour of this amazing natural phenomenon. As well as hitting the beach, there are many other outdoor activities in Tauranga to enjoy. Visit McLaren Falls park for hiking, swimming, fishing and camping, or kayaking. For something a bit different, try blokarting (land yachting) in the place where it was invented. Tauranga is a short trip from Auckland, Hamilton, Rotorua or the Coromandel Peninsula. InterCity has daily buses to and from Tauranga that connect to towns and cities all around the North Island.